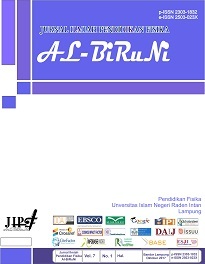 Jurnal Ilmiah Pendidikan Fisika Al-Biruni (Al Biruni Journal of Physics Education), [p-ISSN: 2303-1832, e-ISSN: 2503-023X] is medium of communication for researchers, lecturers, teachers, practitioners, and University students that covers issues such as the improvement of physics learning technic including the development of instruments of physics evaluation, development of physics instructional media, and the development of learning model of physics by considering the local wisdom and enriched with the principal of religion and culture. Theoretical physics and the current issue of applied physics are also welcome, However, the article related and integrated to the value of religion and culture will be prioritized. Jurnal Ilmiah Pendidikan Fisika Al-Biruni published comprehensive research articles and reviews by leading experts in the field. Selected articles, which has a high scientific achievement, provide important new knowledge, and high benefits to society of physics and physics education. The Journal was first published in 2012 and regularly published twice per year in April and October. Since 2014 this journal began in the online. This journal collaborates with Perkumpulan Pendidik IPA Indonesia (PPII) / Indonesian Society for Science Educators. Jurnal Ilmiah Pendidikan Fisika Al-Biruni has become a CrossRef Member since the year 2017. Therefore, all articles published by JIPF Al-Biruni will have unique DOI number. JIPF Al-Biruni is accredited by the Ministry of Research, Technology and Higher Education Republic of Indonesia Number 21/E/KPT/2018 (Grade 2). Accreditation is valid for five years, that is: from volume 5 no. 1, 2016, until volume 9 no. 2, 2020. This journal welcomes submissions all year round. Submissions are reviewed upon receipt. Template manuscript can be downloaded Here. Manuscript accepted is written in standard Indonesian language or English. Scientific Literacy: How is it Evolved to Pre-Service Physics Teacher?